It's the end of June, my deadline for sketching on the bus. I looked over the half filled sketch book last night, and it's not a sucess. I have proven to myself that having a sketch book doesn't make my sketching improve. This is a spool of thin cotton velour yarn that was going cheap at the embroiders' guild meeting a few years ago. 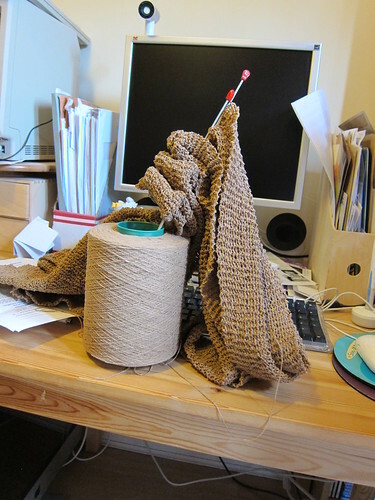 I have been knitting it up for quite a while now, usually just when I'm doing my minimum 30 minutes of Wii Fit. (Exercise is easier to do if I can do something else at the same time.) It's 4 meters long at the moment. What is it going to be? It's going to be the edging on a quilt. Have you seen the stellarquilts? I love their textural qualities. Originally, I was thinking of trying to make one myself, but the amount of stitching was too intimidating. I started thinking about how to make a simpler quilt, but focusing on texture. My current idea is to put together a selection of different textured fabrics, including some swatches of knitting, in fairly large pieces without following a pattern. If the totally patternless sewing is too difficult, Plan B involves sewing patternless strips, then sewing the strips together. For the backing, I have an old king size duvet cover in my fabric stash, so it will be a large quilt when it all gets put together. I know the knitting will shrink, but I'm not sure by how much. If it shrinks to just the right size to edge the entire quilt, I will be very surprised. Since the whole quilt is planned to be patternless, I'm not bothered if I need to splice in a different material for the edging. The important thing is to have something that feels good, and I'm certain that this bit of knitting will be wonderful to touch. The need to assess my use of time and what goals I have is still building. My natural inclination is to stop doing something if it gets hard, but if I want to ever get something done, I'm going to have to find a way of managing the frustration and working through it. Or, change my mind about what I want to do.